My improvised light table has substantially improved the quality of my art, I think. Please do! That's a fairly large part of why I put my art out there, after all. —in Vynkor's drawing the upper arms are a tad too long and the lower ones a tad too short, they should be equal-ish in length. I'm still working on getting an intuitive understanding of the necessary proportions. Soon I'll be able to make a sketch with the proper ones without using a compass! You don't necessarily have to lose any of the hands, you can just shorten the forearm and lengthen the upper arm by moving the elbow a bit. I generally start with a skeleton stick model for the anatomy, then it's decently easy to make sure the part between shoulder and elbow and elbow and wrist are the same length. The chassis (and integral motors) of Vynkor's arm. It's turning out a little chunkier than I'd originally expected, but I think that's fine. It is the armored variant, after all, and there must be some reason it doesn't fit in a suit. I'm having a bit of a hard time working out the geometry on the hand. I think I know what I want to happen, but achieving that is going to be unpleasantly fiddly. Also the first knuckle of each finger (and the thumb) is pretty complex. I'm essentially building a universal joint, same as the wrist, in each. Which means tiny, breakable parts. I've considered flexure joints for these instead, but those are 1. a pain to model and 2. probably weaker than tiny U-joints? The other knuckles are just regular hinges with integrated bushings. If anyone wants to discuss finger joints I'll be in IRC tomorrow. The roll joints (the ones in the middle of each arm segment) have integrated hydraulic motors. The one for shoulder roll is visible, sandwiched between its bearings in the upper arm. The motor/bearing/far arm segment assembly is locked into place first by bolts through flanges in the motor housing, and then by a thick semicircular casing. 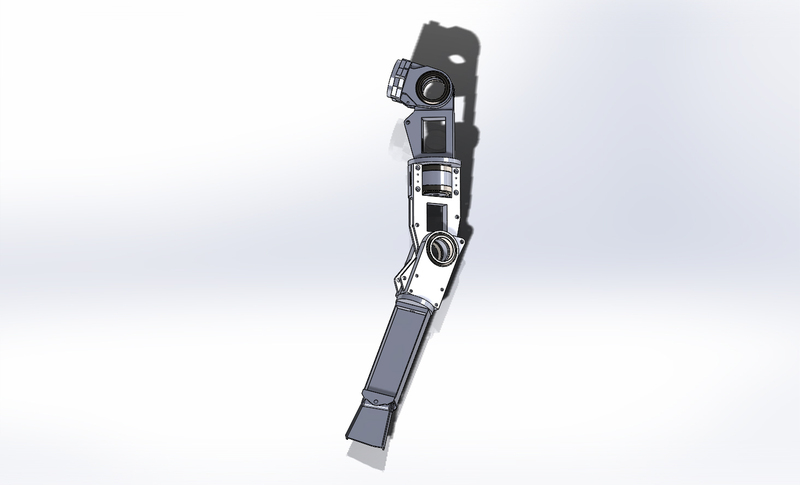 I haven't figured out how to deliver the hydraulic lines to the forearm one---currently it's completely encased. I'll probably just cut a slot into the chassis. The space constraints are getting kind of dire. I'm not sure if I'll be able to fit three banks of linear actuators with sufficient stroke to actually move everything properly into the forearm. Weird solutions like flexible rotors integrated into the cables themselves have begun to float in my mind. Also, the hydraulic pump isn't going to be as big as I might've liked. I'll probably have to chalk that up to Future Technology being Just Better. I haven't actually validated the positions of the piston attachment points. It may be that they move substantially before this is over. Hopefully I can get them to work at all without a major redesign. As much as I'd like to, looming the cables themselves may not happen. There are forty-eight of the bastards, you see, and I'm just not sure it's practical to draw them all. Not to mention that I don't even have a good idea for modeling the cable sheaths. After I get all the internal components mocked up, it'll be time for designing the external plating. I think my paper designs will remain mostly viable. There will definitely be some changes made, though, and drilling holes into the chassis to actually mount the plating is going to be interesting.